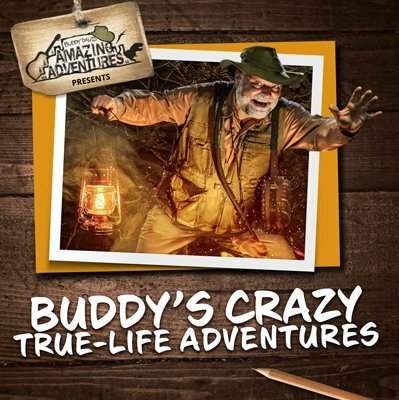 Give Buddy’s Crazy True-Life Adventures to family and friends, and get one for yourself too! We started out this morning at 7:15 from home heading toward the museum. There were a few snow flurries, but it didn’t seem too bad. We discovered on the way to Columbus that the roads were icy. We passed several cars in the ditch and one even flipped on its top. It took us approximately two hours to get through Columbus. This normally takes an hour. However, on the other side of Columbus toward Cincinnati, there was no snow, and the roads were dry. It is amazing what a few miles will do! We arrived at the museum safe and sound. We are still working on the new CD project and have 16 songs. Two new songs I wrote are (1) “The Books of the Bible” and (2) “The Ten Commandments.” We are excited to have this project moving forward. I have been traveling some in Ohio over the past few days and speaking at Community Bible Church in Tipp City, Troy Christian School in Troy, and Dupont Church of the Brethren in Dupont. I was very encouraged to find these churches and schools upholding God’s Word. May God continue to bless their ministries.